Trust the experts at Buddy's Flooring America for cost-effective flooring options that match your personal style. We have several decades of experience in providing superior flooring solutions and installation services to our customers, so when you need luxury vinyl flooring in Miamisburg, OH, you can count on us as your go-to source. Our flooring showroom is full of beautiful, durable, and competitively priced vinyl tile and plank, so hurry in to start searching for your dream floors. Our friendly staff is always ready to help you find exactly what you need. Not only that, we strive to offer our products at the lowest prices on the market. This makes it easier and more affordable than ever to bring home the floors you have always wanted. Bring more comfort to your kitchen, bathroom, or work space by choosing luxury vinyl tile or plank flooring. When you visit our vinyl tile store, our professionals can provide even more detailed information about benefits of choosing this type of flooring. But here are a few fast facts. 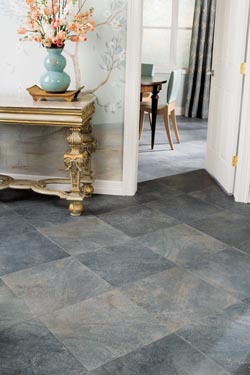 Compared to travertine or marble tile, vinyl has more give to the material and has a cushioned backing so it is comfortable to stand on for long periods of time. In addition to comfort, luxury vinyl is also very easy to maintain. It is resistant to moisture and has up to three layers of wear layering to help resist stains and scuffs. No matter what colors or patterns you have in mind, you’re sure to find something suitable in our resilient vinyl flooring collection. Luxury vinyl comes in a wide array of patterns that resemble standard ceramic tiles, stone, or even hardwood. Best of all, though our selection is large, our helpful showroom staff is ready to give you guidance and pull samples of the vinyl flooring that will best suit your needs. Count on our professionals to find the perfect flooring for your home. We take the time to learn your unique needs, including your budget, personal style preferences, and the specifics of your project in order to narrow down the selection to the choices that apply to your specific situation. Our installation partners then make quick work installing your luxury vinyl flooring. Because our team works with you from beginning to end, you can have peace of mind knowing your needs are understood and your expectations are met. Contact us or stop by our showroom to learn more about luxury vinyl flooring. We proudly serve residents of West Carrollton, Germantown, and Miamisburg, Ohio, as well as those in Franklin, Springboro, Centerville, and Oakwood.